HP Z1 WorkstationHP has announced that the HP Z1 Workstation, recently unveiled in Las Vegas on February 14th at the HP Global Partnership Conference is now available in Europe, Middle East and Africa at a starting price of €1,599 through its global resellers and partners. Billed as the world’s first all-in-one workstation with a 68.6 cm (27’’) diagonal display, it’s built for computer-aided design, digital media and entertainment professionals. The company says it offers a full range of workstation-class graphics cards and processors, and is thoroughly tested and certified to work with today’s leading industry applications. The display of the new HP Z1 snaps open so users can easily swap out parts and make upgrades without any tools required. 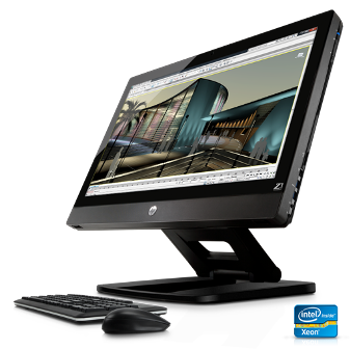 It combines a sleek industrial design with accelerated performance featuring Intel® Xeon® processors, NVIDIA Quadro graphics, support for more than 1 billion colours and, as you would expect from HP, world-class reliability.